Own a Bible? Got a Bible app on your phone? That means you’ve access to one of the most dangerous books available today. Forget terrorist handbooks – in some places being caught with a Bible can lead to imprisonment, torture, and even death. In North Korea, Central Asia and across the Middle East, God’s living Word is being banned, confiscated, restricted, censored, burnt and destroyed. That means the Bible is also one of the most hidden books in history. Those who know the truth and hope contained inside its pages don’t give it up easily. Today, the Bible is buried, concealed and covered; it’s hidden in pots and buried deep under forest floors; it’s stowed away behind secret panels, stashed in dark cellars and disguised under false covers. But there’s one place that secret, persecuted Christians know they can safely keep Scripture; in their hearts. People are literally dying to remember this book. Did you get that? They learnt as much of the Bible as they could, by heart. By memorising Scripture, these Chinese Christians always had an immediate source of encouragement, direction, hope and joy – even when faced with the toughest situations. We live in a world where our phones can access all the information we could ever need with just a few swipes. We don’t need to remember, as a digital assistant will remind us. We don’t need to learn Scripture, as we can Google any passage whenever we want. With all the benefits of modern tech, we run the risk of losing our ability to remember and recall God’s living Word. For many persecuted Christians, a Bible is hard to come by, so it has massive worth. Our persecuted family know that the words in the pages of the Bible can introduce us to the God of life. Whether we have no access to a Bible, or one in every room of our house, God’s Word is infinitely valuable because of who it can reveal. The question is: Have we, who have multiple translations of the Bible sitting around our homes, on our phones and in our churches, forgotten just how valuable and essential the Bible is? Back in the late seventies, the church in Vietnam was facing serious pressure from a Communist dictatorship and Bibles were pretty scarce. When secret deliveries did get through to churches, there weren’t enough Bibles to go round. In fact, they were so precious that leaders of one secret group decided that, to receive a Bible, you had to prove you were worthy of having it. That meant learning and reciting Psalm 119 from start to finish. If you didn’t know, that’s 176 verses – and all of that just got you on a waiting list! stay on the path of purity? Dozens, if not hundreds of Vietnamese Christians would have learnt and recited those words. And they meant it. They lived it. They had to hide God’s Word in their hearts, because there weren’t enough Bibles, and being caught with one was a serious offence. You see, we have access – through our tech and multiple copies of the Bible – but access isn’t the same as knowing. We need to know God’s Word, as those Vietnamese Christians did. When we learn and memorise Scripture, hiding it in our hearts, we can truly know and recall God’s love and promises whenever we need them. Like secret Christians around the world, we can be inspired to learn Scripture to make sure we’re always prepared, no matter what we face. We want to help you remember! 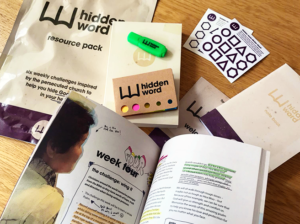 We’ve recently launched a ground-breaking new resource called Hidden Word. It’s a series of six weekly challenges to help you learn chunks of Scripture that have meaning to persecuted Christians. Over six weeks, you’ll connect with your persecuted family and God’s Word, getting into the Bible, and closer to Jesus in the process. Hidden Word is a quality resource you can use use to make your devotional times more interactive and long-lasting. Plus, we’ve scaled up some of the ideas so you can use them in youth and small group settings. 1. Start by praying. Ask God’s Spirit to help you remember the verses and passages you read. 2. Write a passage down, then write it down again and again and again! 3. Record yourself reading a passage aloud and listen to it over and over. 4. Highlight a passage with different colours to help your mind recall what you’ve read. 5. Set the passage as your phone’s lock screen – you’ll see it nearly every time you grab your phone.